I can never really understand why people buy shop bought hummus when it is so easy and cheap to make at home, AND I have never had one of those from a plastic thingummy tub that tastes anywhere near as good as this. All you need is a food processor and a few basic ingredients – just throw it all in and bingo! IT IS NOT HARD TO MAKE. This is my go to dish for taking to a party – it’s often requested and gets lots of compliments, so is definitely one of those dishes where the making of perfect has been in the practice. 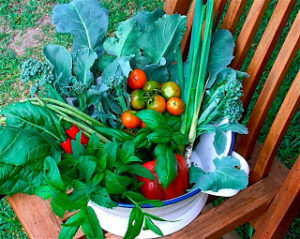 Apart from being so quick, easy and cheap to make, it is incredibly good for you – this is the real deal as far as super foods are concerned. 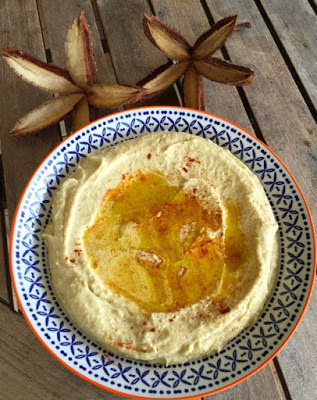 Hummus is high in iron and vitamin C and also has significant amounts of folate and vitamin B6. The chickpeas are a good source of protein, dietary fibre, calcium and potassium. Tahini consists mostly of sesame seeds, which are an excellent source of the amino acid methionine, complementing the proteins in the chickpeas – and the sesame is where the high source of iron comes from as well as being a good source of calcium, potassium and phosphorus. Fresh lemon juice is high in vitamin C.
It’s a great vegetarian food and like other combinations of grains and pulses, it serves as a complete protein when eaten with bread. No meal in the Middle East would be complete without a freshly made plate of hummus and passions run high over its origin and ‘the authentic recipe’. In fact, the ‘hummus wars’ have been going on for some time between Lebanon (who want to patent the recipe) and Israel (who exports the largest quantities around the world). This is the recipe I have tweaked over the years to be to my taste and I make it at least once a week and, there’s an added bonus – the grandchildren love it. 2 tbs tahini hulled (sesame seed paste) – important to use the pale variety otherwise it can be bitter. Strain the chick peas of all their canned liquid. Put all ingredients in a food processor and pulse until a smooth consistency. If, at this stage, the hummus is very thick you may want to add a small amount of water to thin it. Serve on a plate with the hummus fluffed up around the edge – easy to do with the back of a spoon. Drizzle with olive oil and paprika or finely chopped parsley or mint. This is making me hungry! TOP TIP: This recipe is to my taste. You may think it needs more; salt, lemon juice, tahini or garlic so it’s important to taste it, once you have processed it, and adjust accordingly. ALSO – hummus is supposed to be light and fluffy – not thick and gluggy – that’s where adding a little water (filtered) helps. Try it and see for yourself. Graffiti from a wall in inner Sydney in the late 70’s. “God hates homos”. Written underneath – “But does he like tabouli”?